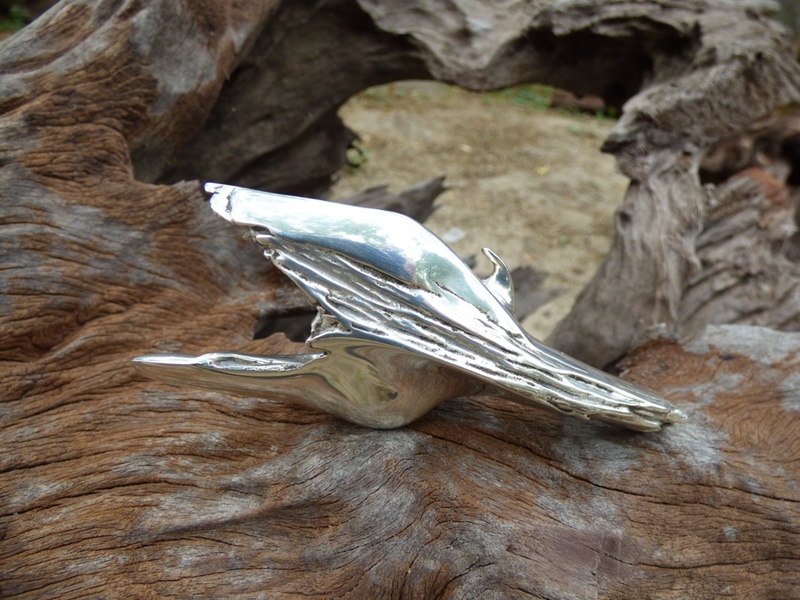 Side view of the Swamp Seraph in sterling silver, against a background of weathered wood, showing flowing lines and and wood textures. 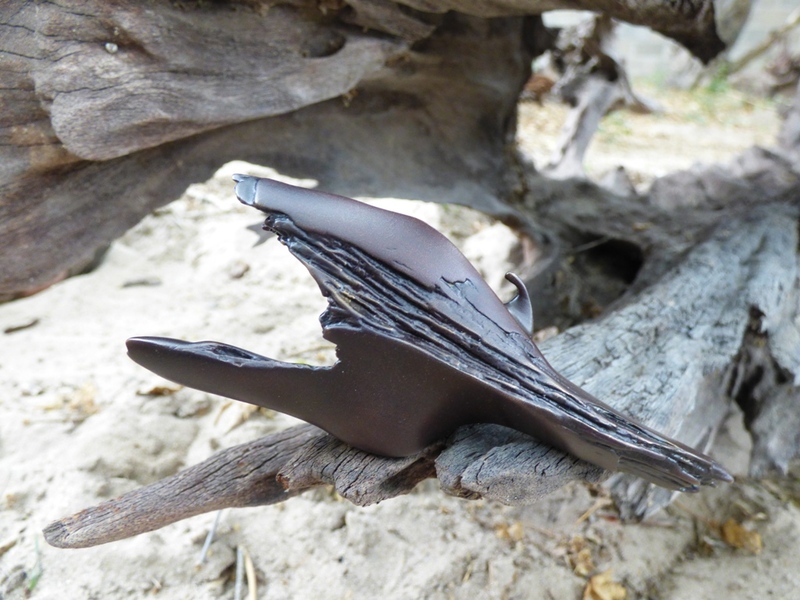 Creating a unique wood sculpture means working in harmony with the materials nature has provided. You have to pay attention to the way a tree has grown and adapted to its surrounding conditions – dry and wet years, gales, shifting soils, hungry insects, and even hungrier herbivores such as elephants. Every piece of wood is different, demanding that you understand its strong and weak points, its weight, and the nature of its grain. And the textures created by natural processes help to create a unique piece of art. Deciding how much rough surface to retain in one of my sculptures depends a lot on this understanding. As a sculpture takes shape, interpreting the story it has inspired, I am guided to use irregular patches and almost-hidden textures as a contrast to the smooth surfaces that define the piece. Transforming the finished wood sculpture into a silver or bronze miniature requires careful reproduction of these details. While the finished miniatures possess the distinctive quality of their precious metals, the process of shaping, cleaning and polishing them has to faithfully capture, where it matters, nature’s impact on the original wood. 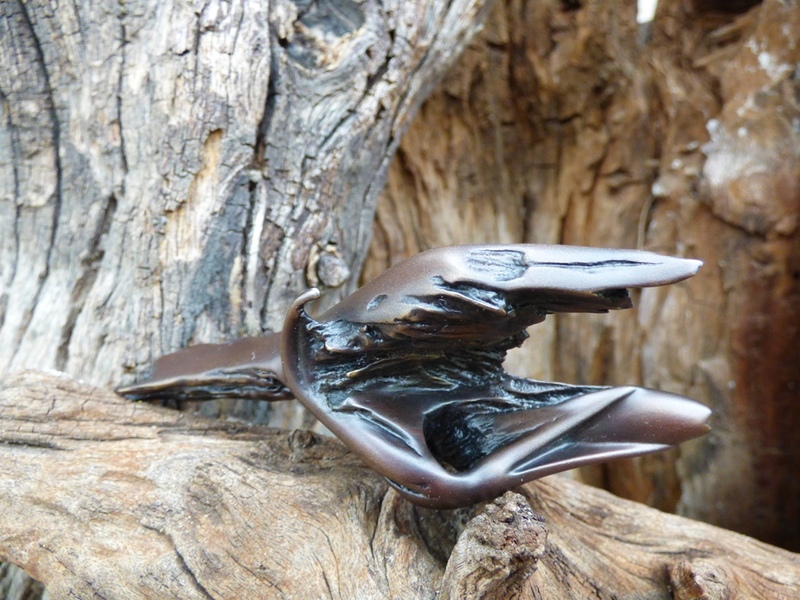 Back view of the Swamp Seraph in bronze, against a background of weathered wood, showing hollow spaces and wood textures. 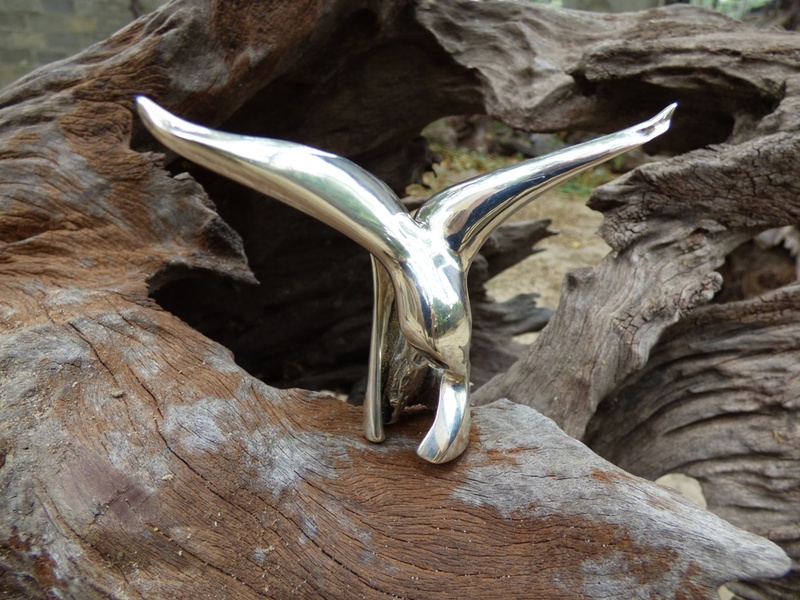 Back view of Gotcha in sterling silver, against a background of weathered wood, fine grooves created by water flowing over the wood surface. Back view of Gotcha! 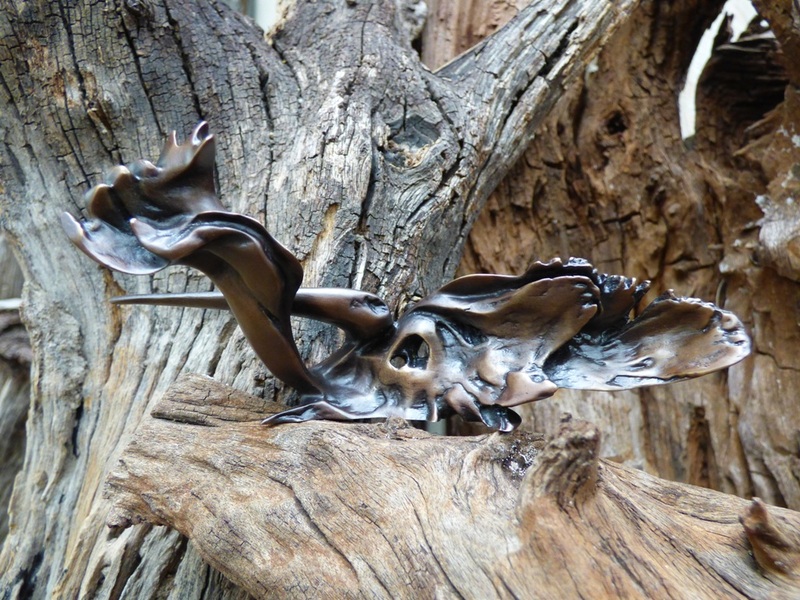 in bronze, against a background of weathered wood, fine grooves created by water flowing over the wood surface. Front view of Gotcha! 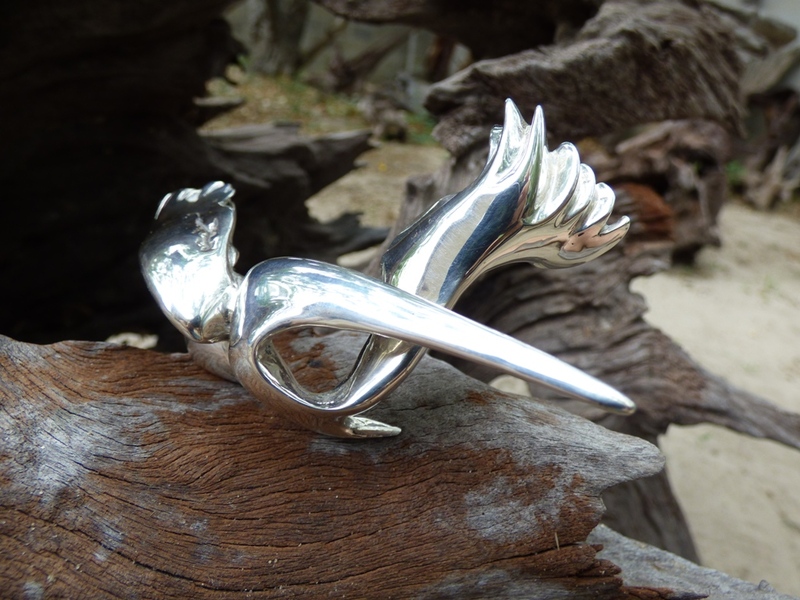 in sterling silver, against a background of weathered wood. Front view of Gotcha! in bronze, against a background of weathered wood. 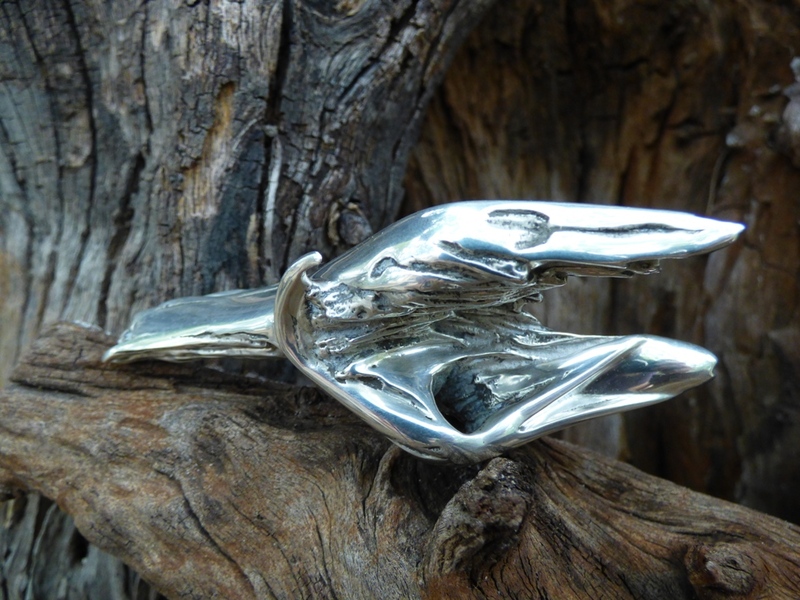 Front view of Catch of the Day in sterling silver, against a background of weathered wood.